This is an experiment. 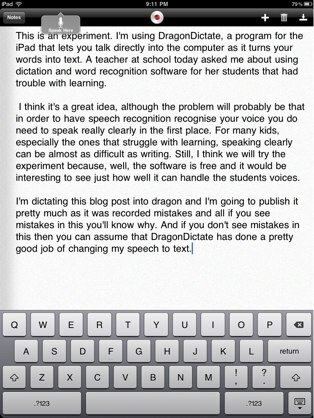 I’m using DragonDictate, a program for the iPad that lets you talk directly into the computer as it turns your words into text. A teacher at school today asked me about using dictation and word recognition software for her students that had trouble with learning. 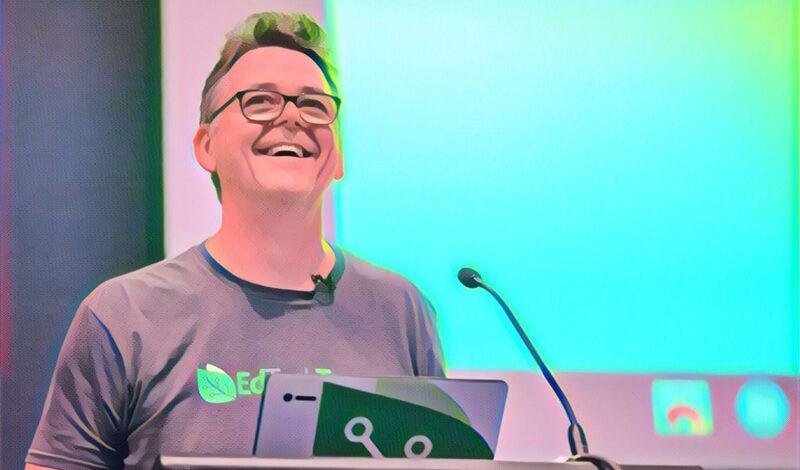 I think it’s a great idea, although the problem will probably be that in order to have speech recognition recognise your voice you do need to speak really clearly in the first place. For many kids, especially the ones that struggle with learning, speaking clearly can be almost as difficult as writing. Still, I think we will try the experiment because, well, the software is free and it would be interesting to see just how well it can handle the students voices. I’m dictating this blog post into dragon and I’m going to publish it pretty much as it was recorded mistakes and all if you see mistakes in this you’ll know why. And if you don’t see mistakes in this then you can assume that DragonDictate has done a pretty good job of changing my speech to text. Speaking Clearly by Chris Betcher is licensed under a Creative Commons Attribution-ShareAlike 4.0 International License. Wow. That was basically 100% accurate. Impressive! They dodgy grammar in the last paragraph was simply because I forgot to tell it to include commas, etc. Other than that, it got the entire three paragraphs absolutely perfect. I find the hardest thing with dictation software is that you need to have the complete sentences formulated in your head and dictate them in a single take. When I type, I have half-formed thoughts and bits of ideas that I sort of cobble together, but when I dictate I need to be far more finished in my ideas before I dictate them. Still, an interesting technology, with obviously a lot of promise. I am writing this using Dragon Dictate. I am finding it doesn’t handle my accent well or maybe I’m not talking clearly enough when I try and dictate something. Now I will try and put a full stop in the right place and stop recording. Uts thet thuck kiwi eccent you hev, eh? Try speaking like a rigular pirson, end see whut hippens? Ah dudn’t know eye hev a koiwi eccent. Uts yeu fullas thet talk funny. I tried Dragon Dictate in the car on the way to work after listening too you talk about it in the recent Virtual Staffroom podcast. I had unusual results to say the least. The text didn’t resemble what I had said – but with road noise I don’t think I was being very fair with my test. I look forward to trying in quieter surroundings. I do agree with your comment about having the sentences well formed before stating to speak. It does seem to be great software for free. Nice work. Macquarie is working on something in the accessibility area to deal with Australian and NZ accents. You’ll be floored at the cost of transcription on heavy lit courses like economics and law. More than welcome to go and see them – they’re doing great stuff and always keen for a yarn about it. After several years of training mine on my laptop is VERY accurate….but you must train your dragon!! Great for long papers especially if you are working off drafts – or dictate quickly then correct a printout or on screen and then re-dictate. That’s what I think has amazed me so much about Dragon on the iPad… it worked like that for me pretty much out of the box. I’ve done no training as such, in fact there doesn’t even seem to be a training mode as there is on the desktop version, so unless it just adapts to my voice on the fly… I’m just not sure how it’s doing it.